Ever since 2012 and 2013, when a wave of attacks by their ethnically Rakhine neighbors in the north-eastern state of Arakan/Rakhine of the Union of Mynamar killed thousands and displaced hundreds of thousands from their homes—driving them into refugee camps abroad or internally displaced people’s (IDP) camps within the country—numerous NGOs and U.N. agencies have warned that they were the population most at risk of genocide. 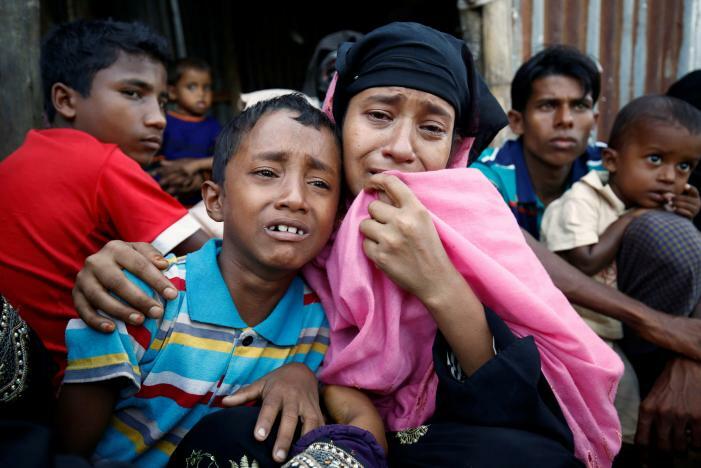 There are somewhere between 1.5 million and 2 million Rohingya people in the world—most born in Myanmar, and most rendered stateless by the country’s 1982 Citizenship Law. Of those, more than half have already been displaced abroad over the past few decades by repeated waves of aggression from either the state or their ethnic Rakhine neighbors. Most notably, in 2015, the exodus culminated in what the world media dubbed “Southeast Asia’s Migrant Crisis.” Of the fewer than 800,000 left in the country, over 110,000 were already in IDP camps in extremely precarious conditions before this latest crisis started. The fundamental problem is that even though more Rohingya are trying to flee the country as we speak, most of those who could have left have done so already. Left behind are those who do not have the resources to pay border officials and people-traffickers to smuggle them across the border, or are not able to withstand the perils of the journey: children, elderly people, women, especially the poorest. We are still at the stage where the ultra-nationalist elements within Myanmar are mostly trying to intimidate the Rohingya to flee the country. Yet even when some of the Rohingya succeed, they often face being sent back, as per the official stance of Bangladesh, the closest neighbor to Arakhan/Rakhine state, where most of the Rohingya refugees go first. But amid the increasingly hostile attitude toward the refugee flow in almost all the neighboring destination countries, the simple fact is that most of those still within Myanmar simply cannot leave or they would have done so a long time ago. It is only a matter of time before the aggressors move to the next logical step. The situation will be hugely exacerbated if the Rohingya start fighting back. At that point, Myanmar will bring all its defense forces to bear on the conflict, and they will have the support of the Buddhist population in the region. But at this point what is left for them to do? They are facing constant harassment, have been almost entirely expropriated so they have nothing left to lose and they can expect to be raped and murdered for no reason whenever an army patrol goes by. And there is nobody who seems willing or able to intervene to protect them. Not the country’s Nobel Peace Prize laureate leader, Aung San Suu Kyi, who has so far completely avoided engaging with the crisis, nor the international community who are waiting for Ms Suu Kyi to solve everything, even as they know she will likely do nothing. For all practical intents and purposes, the genocide has started. It is only a matter of time before the truth hits home, when the dead bodies start piling up. And then it will be too late for soul searching and asking whether we could have done more. Will we fail yet another vulnerable people? Azeem Ibrahim is a Senior Fellow at the Center for Global Policy and author of The Rohingyas: Inside Myanmar’s Hidden Genocide (Hurst Publishers & Oxford University Press).